Holloway’s early season penalty rant; was he actually right? The international break is seen by some as a major inconvenience, an interminable wait that often makes it feel as if the Premier League season has false-started after only three matches. The break has given me a chance to look at something that stuck in my mind from right at the beginning of the Premier League season. In the first weekend of the new top flight campaign we were treated to a trademark Holloway press conference following his Crystal Palace side’s 1-0 defeat to Tottenham. Spurs managed to come through with the three points after Roberto Soldado tucked away what proved to be a contentious penalty, and the Palace manager was not best pleased with the award. The Bristolian was handed, and later accepted, a two match touchline ban for his comments about referees favouring big clubs and refusing to give decisions to the smaller teams. “It’s going to be a long, hard season for me with these people [referees]. “I had this with Blackpool. Certain clubs get fouls and others don’t. Holloway’s acceptance of the charges and the punishment would suggest he acknowledges that what he said should at the very least not have been aired to the public, but the question remains: is he correct based on historical evidence? 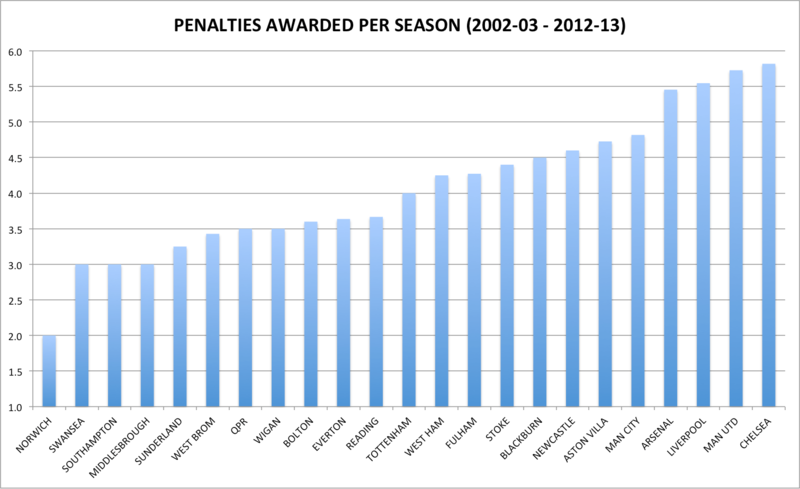 Do bigger teams get more penalty decisions than their less illustrious rivals? At a glance, you can see that the major names in English football feature at the far right of the chart, with Chelsea, Manchester United, Liverpool, Arsenal and Manchester City taking up the top five spots. So far, so aligned with Holloway’s conspiracy theory. However, this measure isn’t entirely fair. These sides, being the best in the country and frequently at the top end of the league, will be expected to score the most goals and therefore will naturally have more penalties in their ‘goals for’ column. Therefore, a fairer method of measuring whether the decisions are affected by the size of the team would be to see penalties awarded as a percentage of goals scored. In this graph, Chelsea, Manchester United and Arsenal are actually below the league average of 8.3%, whilst Stoke, West Ham, Aston Villa and Blackburn now occupy the top four positions. 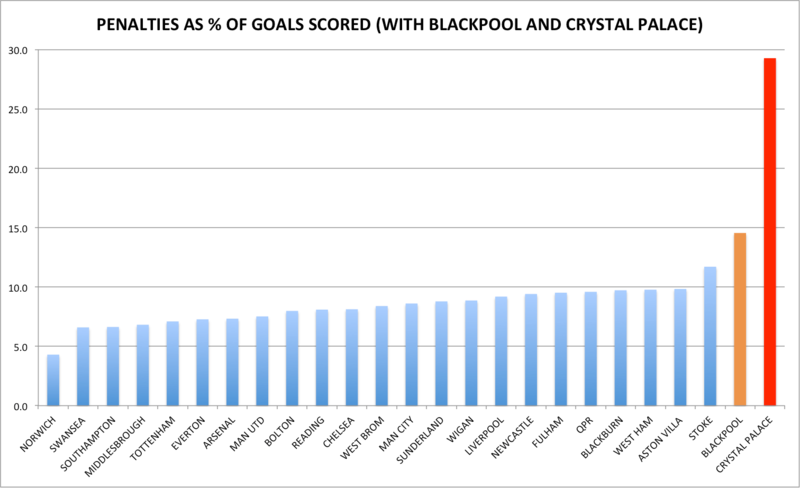 The same graph also looks decidedly different when including the two teams Holloway is specifically mentioning in his quote – Blackpool, who he managed in their only Premier League season, and Crystal Palace. 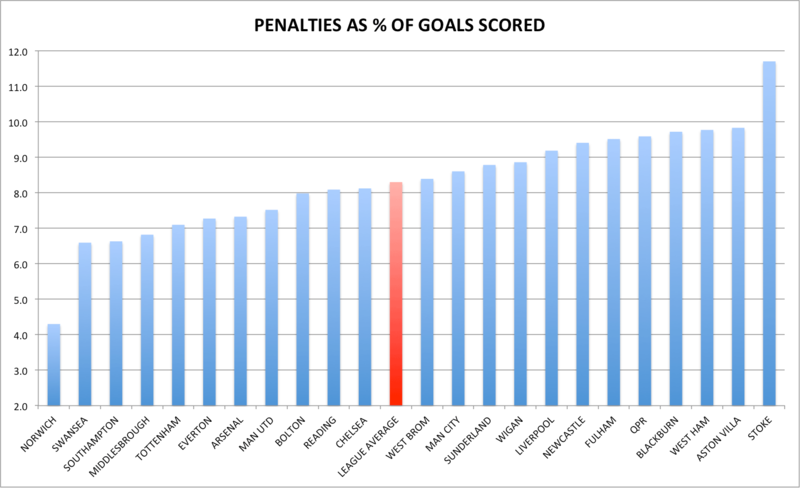 The Andy Johnson factor no doubt played its part in Palace’s incredible 29.3%, but it illustrates a point well – from looking at the numbers, it would appear that the smaller teams are placed at no significant disadvantage in terms of penalties awarded in the Premier League. It looks like Ian Holloway will have to find another excuse should his side perform below his expectations for the rest of the season. Freelance sports broadcaster and media professional based in London.